As we have seen in the previous article there are many things that can affect soil health, which are mainly associated with soil structure, organic matter content, nutrient levels and soil pH. Other causes of soil problems such as pests ,diseases, parasitic fungi, viruses and pollution are dealt with in other, separate articles. If you have conducted an examination of the the soil profile by digging a pit or taking core samples and you have not encountered any rubble or subsoil then your problem is most likely to be poor structure, low organic matter content, low nutrient levels or a combination of these. 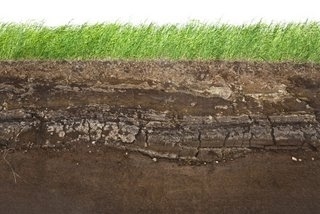 Poor soil structure is usually caused by compaction. If the soil is moist and you find it extremely difficult to insert a garden fork to any great depth then you have a compaction problem. Think about all the traffic your garden gets especially over the lawn such as children playing and builders using heavy equipment. Even gardening can compact your soil especially when mowers are used in wet conditions or heavy wheelbarrows are pushed over it. Ride on mowers are the worst for this as eventually you will observe sunken compacted soil where the wheels have run. If roots cannot breathe then they die which in severe cases would lead to death of the plant. Shallow rooted plants (especially lawns) will first be seen as a problem in the summer especially if there is a drought. Evaporation of water from the top part of the soil profile results in this area becoming extremely dry and it just so happens that this is where all your plant roots are, desperately looking for a drink. If it is too late and you already have a compaction issue there are a number of things which can be done to help open up the soil again. In borders it is usually impossible to get any machinery in so you will have to aerate with a garden fork by forcing it into the ground as far as possible and then levering it back and forth. The addition of large quantities of organic matter can also be effective as it will encourage earthworms and other soil life to make channels and pull the material deeper into the ground. Compaction is usually more severe in lawns as they get the majority of traffic and have very little, if any organic matter added to them. Small lawns can be aerated with a garden fork as outlined earlier but on large lawns it is much better for your health and more cost effective to use a powered aerator. Soils with low levels of organic matter become compacted easier than soils with adequate reserves as the humus helps to keep a network of spaces open within the soil. If large quantities are added to the soil, compaction and several other problems can be dealt with all in one go. The great thing about manure and soil improver is their ability to provide controlled release of all the nutrients that plants need whilst increasing the population of beneficial soil life, which can help reduce the occurrence of diseases and parasitic fungi. Synthetic fertiliser is very popular because it provides nutrients, is easy to apply and is relatively cheap when bought in bulk. However, it does not supply any organic matter and does not usually contain micro nutrients. If your soil is low in one of these then it will not top up the level. Add to that the fact that it can harm beneficial soil life and large quantities of natural gas is used in production, then you can see it is not very eco friendly. Having your garden soil tested for pH and nutrient levels is very useful for the diagnosis of soil problems, otherwise it can be a stab in the dark with many possible causes. We do not know how much fertiliser to add if we do not know what the soil is lacking. It is far too common to see people throwing on large amounts of synthetic fertiliser thinking it can only do good when really it is not necessary and will ultimately poison the plants through overdose. Knowing the pH of your soil is also very useful as it can tell you what plants will grow well in your garden as well as identifying what products can be applied to change the pH to a more suitable value (e.g lime or sulphate of iron). It is usually easier to work with mother nature and use plants which are suited to the growing conditions rather than applying sulphate of iron to temporarily acidify the soil. Poor soils are very common in gardens and often nothing is done to improve them. With a bit of work most of them can be significantly enriched resulting in healthy and happy plants which are less vulnerable to disease and a pleasure to look at. In the next article the different types of soil are described along with methods to improve them for horticultural purposes.